Today, my catalog from Lord Grimley's Manor arrived in the mail. I never fail to be fascinated by the quality of Lord Grimley's work. 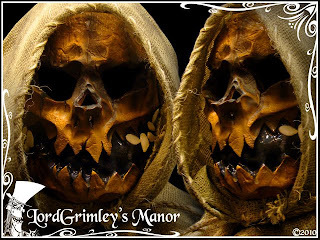 For those who may not know, Lord Grimley's Manor is terrifically spooky company that manufactures and sells Halloween costumes, props and other seasonal goodies. 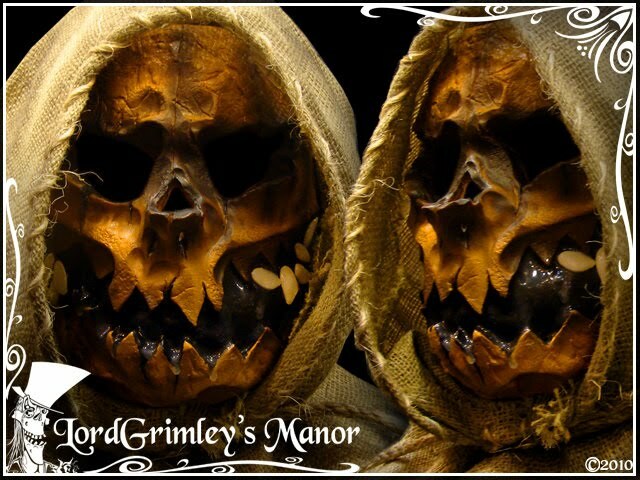 His store is an expansive collection of top-notch props, masks, costumes, shirts and the like. 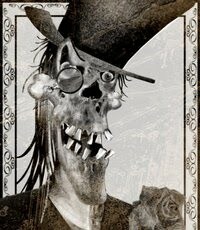 His wonderfully unique style is Halloween art at its best. I have a particular soft spot of glowing orange for his scarecrows, and the way in which he features them. I would love to have this mask don the head of the scarecrow I plan on staking on my lawn this year.